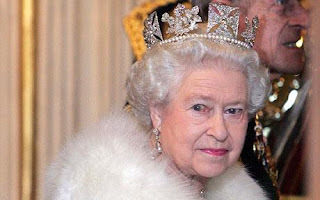 The Queen on December 25th 2012 praised our disabled Olympian athletes, yet she personifies the cuts and attacks our social system has administered on the disabled, old, poor, working and old. She is the ultra tory. She is the person Jo Swinson, Nick Clegg and David Cameron look to as the pinnacle of a society they want to encourage. People wonder at her mystery – what kind of woman is behind the banal celebrity line-up handshake comments? I have told a few people about the Queens shoe breaker inner. I have also told people about the people who dress Prince Charles and the other helpless Royals, from pulling on their underwear to tying their shoes. And people fall into two camps. One camp is the , “Wow, how luxurious!” and the other camp is incredulous. Personally I think it says a lot about our social crisis – the inequality and poverty and violence that permeates the Western world. It exposes the lie of “everyone is born equal with the same chances in life,” and it helps perpetuate slavery, exploitation, poverty and the latest dreadful lie of the deserving and undeserving poor. A few years ago I was in Cuba. We stayed in a resort, served meals and drinks by Professors and other highly educated people. I noticed a real clash between our “culture” and theirs in the interactions between the tourists and the hotel workers. The tourists saw their role as one of being pandered to. They had worked hard all year for this two week luxury. This was their chance to be queens and kings. This meant that those in service to this should pander to their every whim. The service workers should go out of their way to ensure they had all they need and discomfort should be completely eliminated from their lives in the two weeks of superiority they had worked for and bought. This caused clashes. The first roots of the clash come between the worker and the hotel owner (the hotels are owned by capitalist companies). In a socialist run restaurant or bar, there will be perhaps (as we saw outside of the tourist zones) more workers than needed - but this meant that no-one was under pressure, and everyone’s needs were met and no-one lost dignity. In a capitalist run restaurant or café or bar, the minimum amount of staff are put in place in order to maximise takings. At peak times in the capitalist run Cuban resort hotel, as in any hotel or café or bar in the West, staff were under pressure. And this meant the customer became frustrated and some took it out on the staff. The difference in how staff in hotels/bars/cafes I have worked in in the West handle this pressure, and the Cuban workers who KNOW that all are equal around them, is that the Cuban worker bit back when barked at. And quite rightly so. I witnessed a barman who had been working up a sweat in trying to keep up with the demand for free mojitos and daiquiris, get frustrated at the impatience of the Canadian and British customers. He threw a mojito into the sink behind the bar, plastic cup and all, and walked away, his bar manager going after him to calm and comfort him (a very different reaction to most managers I know when a worker expresses the pressure they feel). A Spanish speaker told me the man was upset at how the tourists were treating him as a robot and said that, “these people are mean!” or words to that effect. Contrast this with the laid back atmosphere in an off campus Cuban run bar in town later that evening, when the lively crowd - of mostly Cubans laughed and chatted and waited patiently while drinks were poured and meaningful interactions took place between customer and bar-person – on an equal footing. Dignity and respect in work. And I could see why someone might choose to want to be a barman in such an atmosphere. This was never the experience I had as a service worker in Ireland, Scotland or England. 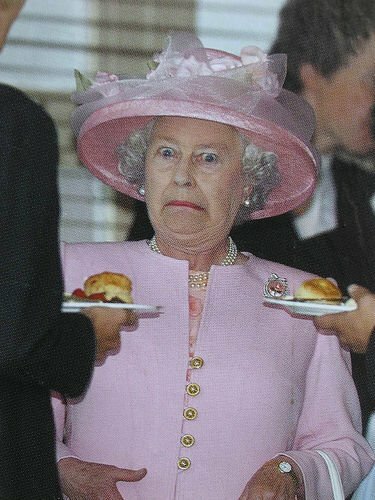 How does this relate to our Queen and her shoes? Well in two ways. 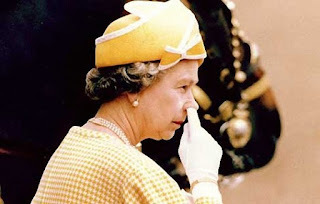 One, the strange reaction of people when I told them about the Queen's precious feet and how they were protected, when they said, “Oh how the other half live,” and “what would it like to be rich?” - as if this having others in servitude was something to aspire to. An acceptable way for someone to have lived all of their lives. An acceptance of the inequity and of the exploitation. Our society teaches us to aspire to having people serve us. Others lower in the scale of worthiness; in the hierarchy; in the class system; less socially mobile… take the pain. They pay proportionately more tax, live without; struggle for time, resources and shelter. But, our society and our political system tells us, this is quite rightly so. If you can afford for someone to clean your shoes, massage your shoulders, fight your wars for corporate control of other countries resources and give their bodies for your sexual pleasure, why shouldn't you take? You've worked hard for it. They haven’t. In my opinion, having someone break in her shoes says more about the character of the Queen and of our unequal and violent society than almost anything else I can think of. This lovely, grey haired, waving old woman has, all of her life, thought it appropriate for a poorer person to take the pain of the tight new shoes. She believes her feet are so much more valuable than her minions and they should not blister, nor bleed, but a plebs bleeding feet is an acceptable sacrifice to their social better. This is a social norm to our head of state. 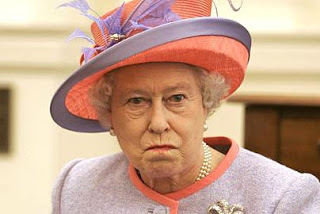 The Queen personifies our cruel, impoverishing, undignified social system. If the established church's God insists on "saving her" even though she intrinsically believes others should be tortured by the pain of her tight shoes; if the country believes her position of having minions deal with her every whim is an acceptable price for her existence then church, state and country are complicit in every old persons death this cold winter, every disabled persons poverty, every soldiers death and every exploited man, woman and child. Hi Plot, its' LolaRennt here from SL. What do you need to stop obeying to this woman and what the Crown "says"? With that crown on her head we can give to people something to eat, as well as shelter, clothes, shoes and water. The point is, we made our politicians, we keep saying "God Save the Queen" but who is going to save us? We need to take actions as soon as possible, this World is not what I want for my children, I have the big compromise with them to make the difference. I invite you to keep in contact to me to see what can we organise, something named Pro and not Anti. Pro-evolution, pro all races united, Pro consume what's on the real markets, not supermarkets. It might be called Pro, so it has a good meaning since we are talking about it. All Anti are negatives thoughts and we need positive thoughts to be happy. This is my opinion, hope someone read it and maybe call me crazy but I'm saying what I think and is what really matters to me, to make this real: the union of some citizens around the world making the change of conciousness. Lola- I cant believe I have just read this- sorry- I had not realised you had replied. I agree with you- we are not anti- we are pro. Positive. Yes- the first step is people wanting positive change. Lets help influence that!